Place all the fruit, mustard seeds, sugar and the zest in a saucepan. Put the juice in a measuring cup and add enough water to make 2 cups. Whisk in the mustard and vinegar and stir into the fruit. Ciders are so hot right now and breweries all over the globe are getting in on the game. Basically just apples and yeast, ciders were the American drink of choice early on—it was a lot easier for pilgrims to throw some apples in a barrel and let mother nature make booze than to acquire all the equipment and expertise to make beer. Don't make the mistake of translating it as "mustard". 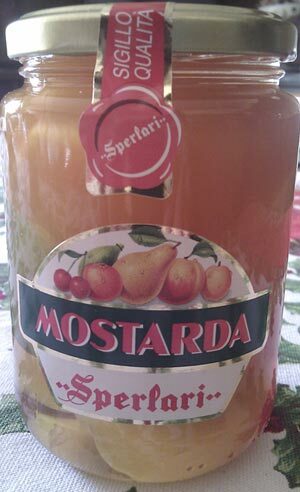 Mostarda does have a little bit of mustard in it, but it's really a combination of preserved fruit in syrup with a bit of a kick. The kick comes from mustard oil, mustard essence, dry mustard, mustard seeds or some combination thereof. Other ingredients include sugar or honey, wine, vinegar and sometimes citrus juice.